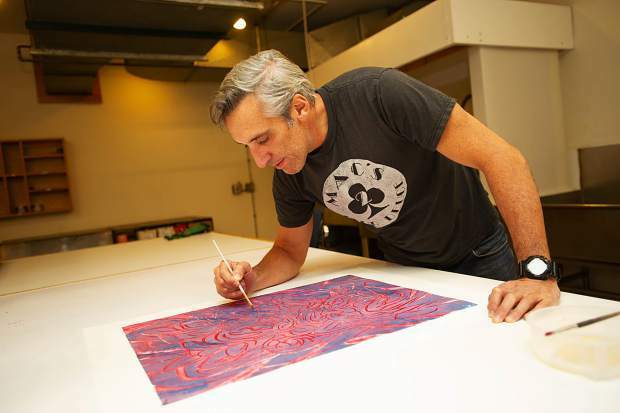 Emilio Perez working in the painting studio Anderson Ranch in Snowmass. 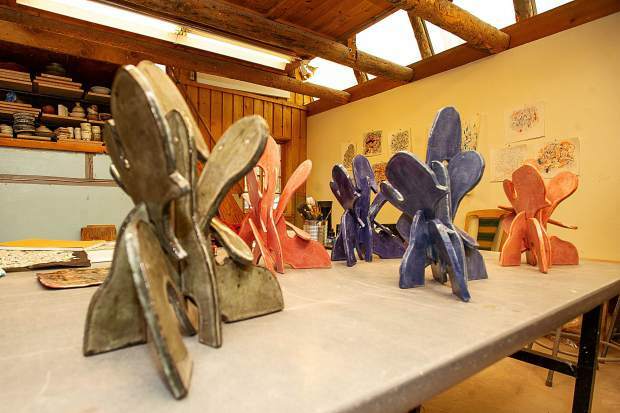 Ceramic creations by artist Emilio Perez from his time spent at Anderson Ranch. 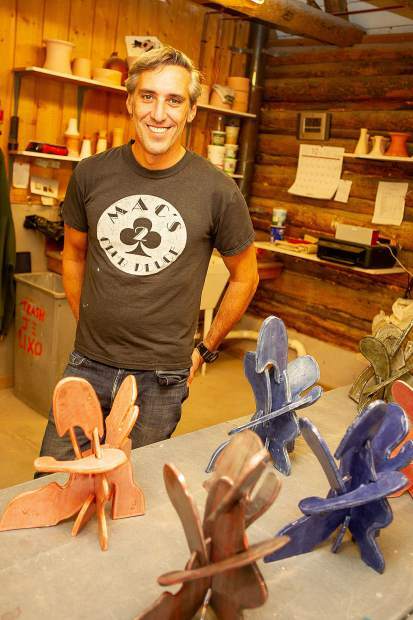 Artist Emilio Perez in front of his ceramic creations from Anderson Ranch. A detail of artist Emilio Perez's painting. 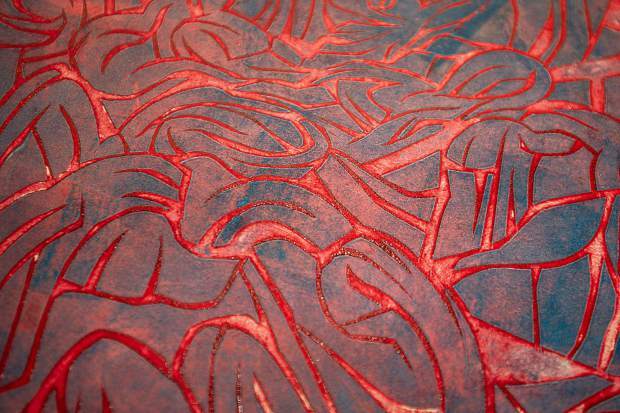 One of the printing techniques Emilio Perez uses on his paintings. 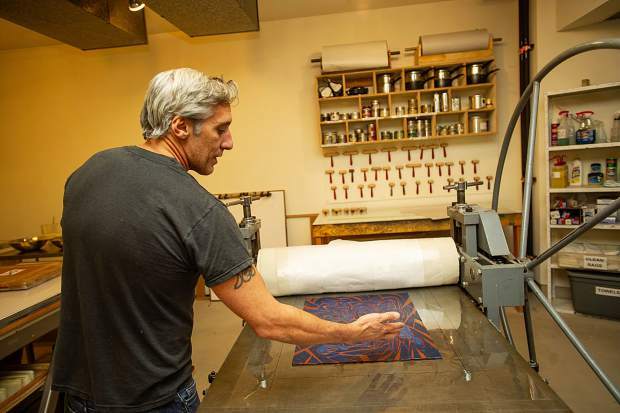 When Emilio Perez arrived at Anderson Ranch Arts Center on a snowy early October day, the artist more or less had the Snowmass Village campus’s studios all to himself. A painter and muralist best known for massive works of public art, Perez spent the month in the quiet of the offseason working small and working in three dimensions — making a series of modular table-top ceramic sculptures. Perez put in 12-hour days working with clay, applying glazes, firing his pieces and becoming a beginner again. The autumn resident artists eventually trickled into the Ranch. Perez conducted critique sessions with them and gave a public lecture. But his visit was still far from the hustle and grind of his working life in New York, where his latest public installation starts going up in November at a Brooklyn subway station. The clay work and the dialogue he found with the young and emerging artists at the Ranch, he says, offered a creative purity that can be hard for him to recapture in New York, where the life of a working artist is wrapped up in the business of being a working artist. “An experience like this reminds you why you make art, which is the joy of doing it, the practice of doing it, being in the moment,” he says. In November, he will begin installing his next big piece — a mosaic on the walls of a renovated subway station. 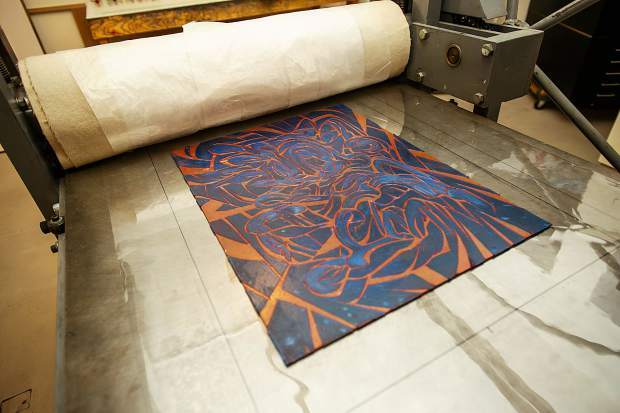 That project has involved the unwieldy bureaucracy the Metropolitan Transportation Authority and New York City, engineers, architects and a team of fabricators in Mexico who are making the small glass pieces for the mural. “I enjoy it because I like the interacting with people, but it does take away from the fun part, which is just hanging out and making a mess and letting mistakes happen,” he says. 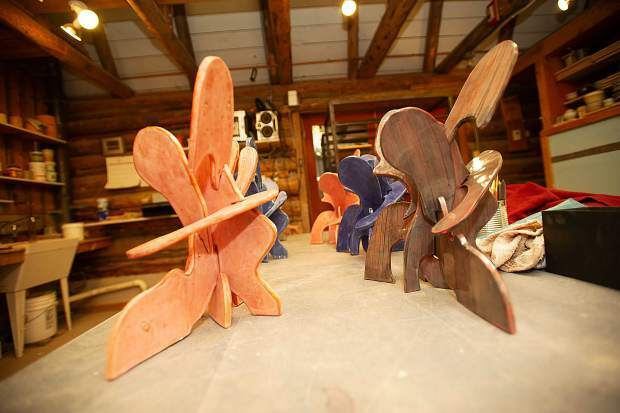 Perez is no stranger to Aspen and Snowmass, having visited for the Aspen Art Museum’s Art Crush fundraiser and taught painting workshops at Anderson Ranch. But this was his first time digging in and making work here. 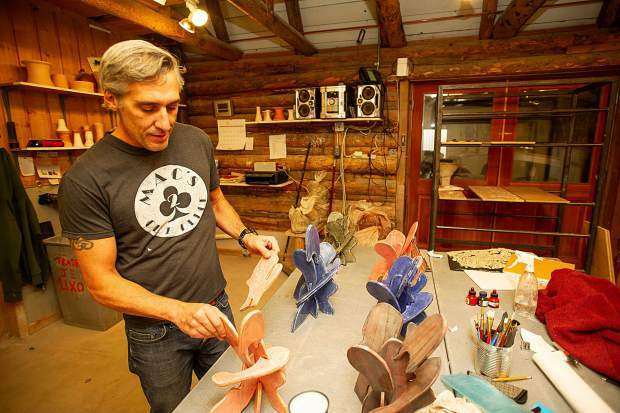 The vaunted history of ceramics at Anderson Ranch inspired him. He arrived with a cardboard model of the sculptural form he was thinking about — a series of flat interlocking clay pieces that each take the rounded curlicue gestural form that’s become his signature in paintings. His visual vocabulary, he found, transferred from painting to this first substantial work in clay. The modesty and small scale of these sculptures are more or less the polar opposite of Perez’s works that have put his fingerprints on some of the world’s most high-profile public spaces — works like “Dream Season,” a video piece that took over Times Square in November 2016, or his 65-foot mural on the Malecón for the Havana Biennial in Cuba (he’s now at work on a new mural there with crowd-sourced visuals for next year’s biennial).